After being moved hotels at the last minute due to an overbooking issue I did not have much option but to accept. Hotel was nice and clean, staff friendly and helpful except the rude night porter. Pool area large however doors do not open until 0930 which was a shame as plenty people wanted to get in the sun from 0800. Booked for breakfast which was nice, hot and plenty of it. 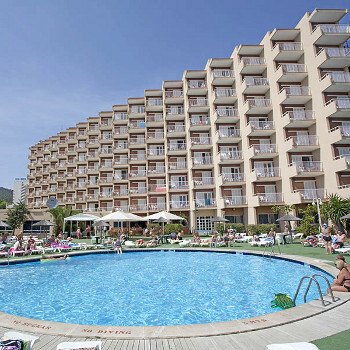 Centrally located in the resort of Palma Nova close to the sea front. Only downside (as well as the additional charge) the noise levels during the night were totally UNACCEPTABLE! I would not recommend the hotel to anyone over 21... Noise was extreme, shouting, arguments, doors slamming, screaming. Impossible to sleep. Hotel tip: Only book if you want to party all night and do not require much sleep. Rooms only suitable for 2 people? On our arrival to the Hotel the reception is very welcoming with lovely staff that offers advice and information about the area. We went to our room which was on the fifth floor (out of seven) looking out over the sea (you can either have pool view which is a lot quieter or Sea View where it is a little noisier due to the road below). The rooms are very small with a Twin/Double bed, bed side tables, dressing table and two chairs. The balcony is an ok size with two chairs and a table and the bathroom has a shower over the bath, with plenty of hot water, a toilet and sink. The room is an ideal size for two people, but would advise that it would be crowded if three people were in it. The pool area is lovely with a pool bar, outside toilets and loads of sunbeds. The pool offers a child's pool, but the adult pool is very deep. If you love the sun the pool is ideal, but it does not offer a lot of shade. The restaurant is a buffet. Breakfast offers breads, cereal, and full English breakfast. Evening meals had different soups for starter, a selection of salad, hams, and cheeses with hot food from chicken, Beef and Pork with a selection of vegetables. The deserts have cheese board, cakes, ice creams and fruit. I would advise to go to breakfast and dinner later, as this hotel is more for the older generation and they are queuing at 8am in the morning and 7pm at night (we were going for Breakfast at 9am, and then evening meal about 8pm so we did not queue). The location is ideal 5 minutes walk to the beach and local shops, bars, restaurants opposite the hotel on the way. Overall, for what we paid I would give the hotel 8/10 and the location 9/10. I have just been reading some of the reviews, we have stayed at the Don Bigote 3 times now and we have just booked to return again 0n the 5th May 2013. You cannot please all I think the hotel is good value for money and the staff are very friendly. The food is very good with a very a good choice. The rooms are small but let’s face it you are only in them on a night. Would I stay here again? As you can see we have booked again, I would recommend it. We had a great time, food was first class, better than some 4* hotels I've stayed in. We were on the top (7th) floor and the only noise we heard was from outside of the hotel. It does appear that the older guests are given high level rooms, but it's not an issue as the lifts are quick. The four of us that travelled are all mid 40's early 50's and had no issue with the mainly younger early 20's clientele. The staff were really friendly and welcoming. Probably the worst hotel we have ever stayed in.If you are over 20 years of age and like to sleep at night do not visit this hotel.Almost every night we were woken up by teenagers partying at 4am-6am in the corridors.I know we are on holiday and you expect some noise but this was ridiculous.The entertainment is non existent,i think there were two karaoke nights in a fortnight.On a positive note the location is fantastic for the beach,plenty of sunbeds if you get up at 9am,pool opens at 9.30am.Food not bad as it is only a 2 star hotel not three star which we booked.Arrived home today and looking forward to a good night's sleep.Staff friendly enough. My OH had chose this hotel and I was a little concerned after reading some reviews. We arrived approximately 7pm in the evening and were quickly and efficiently booked in we got to our room and was given exactly what we had asked for, the room was spotlessly clean as was the rest of the hotel. Food at the hotel is very good and plenty of choice especially in the evening. Location of the hotel is great 5 minutes your on the beach and plenty of local bars and shops. Staff at the hotel were friendly and efficient. Entertainment is very lacking but with so many local bars does it really matter, there is plenty going on in the resort. We would definitely visit this hotel again having stayed at the Mimosa Park twice last year I am afraid to say that the Don Bigote is much cleaner and a more pleasant hotel to stay in. Firstly the positives. The hotel room although a little dated was spotlessly clean and the maids kept them that way cleaning the room every day, fresh towels are provided as and when you require them just couldn't fault the maid service. Pool area adequate although again it was rather in need of an upgrade. Location is fine close to sandy beach. Now for the negative and it a big one the Food! breakfast was fine the usual british fare, however the evening meal was something else yes it is eatable as long as you don't care what you eat you just would not pay for it or return if you were given the same type of food in a restaurant no you won't starve but if it wasn't included in the price would you pay for it. I am told the mood of the hotel changes later in the season when the 18-30 hit the hotel we didn't have a problem with noise at night however we didn't really return to hotel until the wee hours and made sure we respected other guests. Thats all people need to do but for some they have a don't care attitude! the hotel don bigote is a very nice hotel, very clean and tidy, maid service was excellant rooms cleaned every day. food was very nice different choice of food every night. the location is spot on 5 mins walk from the beach, and close to shops bars and restaraunts. hotel staff was very friendly and helpfull, there was different entertainment each night something to suit everyone. i would definately go back to this hotel and i would reccomend it to anyone. Evening meal,s were very good with a choice plenty to choose. The Hotel is fine and the maid service excellent the rooms were very clean.